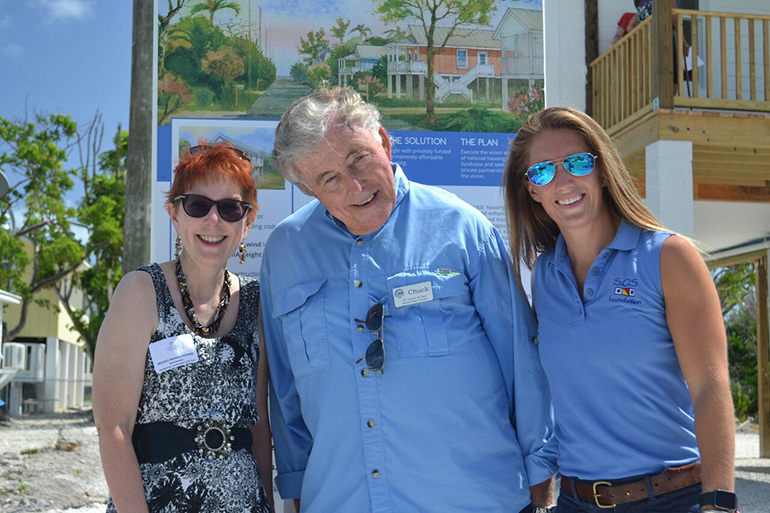 Michele McHale-Pickard of the Florida Keys Community Land Trust, left, poses with Chuck Brush, president of the South Miami-Dade Council of the St. Vincent de Paul Society, and Emily Nixon, deputy director of the SOS Foundation, at the dedication of the first of four Keys Cottages. 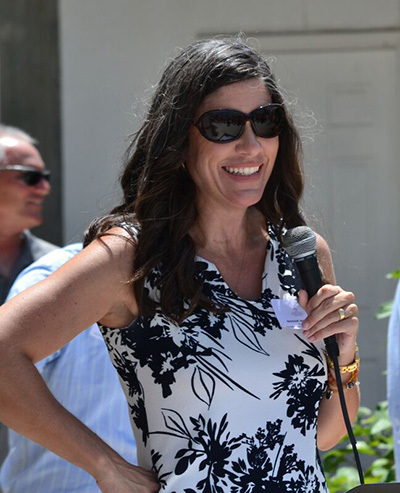 Maggie Whitcomb, founder of the Florida Keys Community Land Trust, speaks at the dedication of the first of four Keys Cottages, permanent, affordable housing for workers in the Keys. BIG PINE KEY | When Irma’s 120 mph winds slammed into Big Pine Key on Sept. 10, 2017, they wiped out 1,200 buildings, plus the trailers in the “Avenues”, a mobile home community where many people lived. One family in the area saw this devastation as a time when their faith called them to action. Maggie and Rich Whitcomb had a home near Big Pine and understood what had happened to the residents of the “Avenues”. Immediately after the storm, the couple formed the Florida Keys Community Land Trust, using their own funds to buy up the destroyed lots ahead of for-profit developers. They put the lots they purchased into the trust so that homes with affordable rents could be built for those who work in the community. The two and three-bedroom homes — measuring 760 sq. ft. and 1092 sq. ft., respectively — have been designed to meet or exceed all required building codes as well as withstand 200 mph winds. They also are raised above the FEMA height requirement. On Aug. 16, about a month shy of Irma’s anniversary, the ribbon was cut and a blessing took place for the first of four of these “Keys Cottages,” which two Catholic agencies had a role in making a reality: the Star of the Sea (SOS) Foundation and the Society of St. Vincent de Paul. 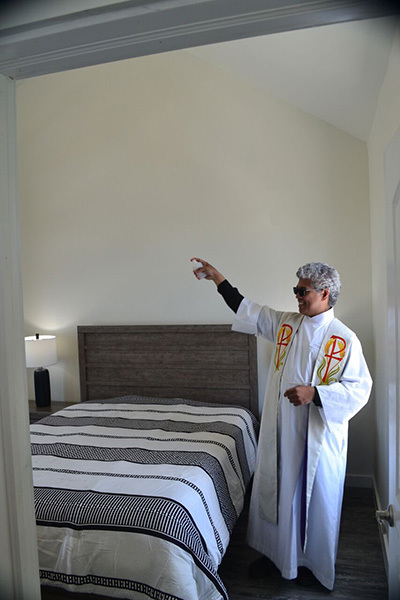 Father Jets Medina, pastor of St. Peter Church in Big Pine Key, sprinkles holy water on the bedroom of the first of four "Keys Cottages" that will provide affordable housing for area workers. SOS's role was to facilitate the donation and delivery of flooring, furniture, and food for the first Keys Cottages. “We plan to work with the FKCLT whenever possible in the future,” said Nixon, who was accompanied by Tom Callahan, executive director of the SOS Foundation. The Society supplied the brand-new furnishings for the first two-bedroom, one-bath Keys Cottage. “The first house is the beginning of our long-term commitment to the Keys during and after the recovery is over,” Brush said. In the sweltering heat of the day, Father Jets Medina, pastor of St. Peter’s Church in Big Pine Key, blessed the new house as well as those who had been instrumental in making it a reality. Father Medina added that he knows “how it feels to be homeless, a little bit,” since St. Peter lost its rectory “and worse, our church” in the hurricane. “It’s hard to rebuild when the contractors around you are … trying to rebuild their own lives and their homes,” the priest said. The Florida Keys Community Land Trust has four more homes almost complete, with more to come.